Frankton Elementary Robotics had a tremendous amount of success last year, but this success created a new problem. Most of the members on a team that went to World’s last year moved up to seventh grade at the junior high. The junior high kids wanted a robotics club, but it didn't exist, had no equipment, or even a club leader. 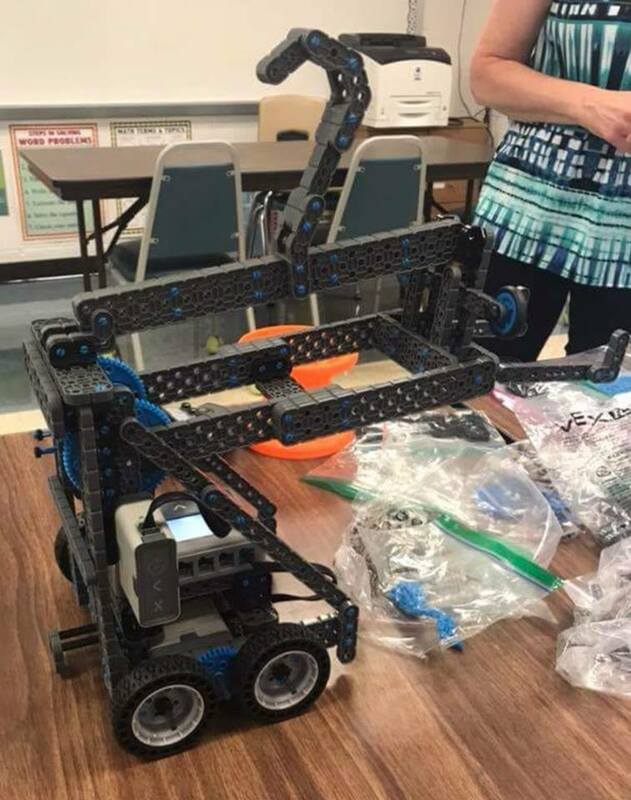 Fortunately, the school administration recognized the need for a Robotics club and in the summer Mrs. Carissa Watters, a junior high math teacher,and Mr. Randy England, an industrial arts teacher, volunteered to lead the club. There was no funding for equipment or supplies. so grants were applied for to purchase the VEX IQ robots and other necessary equipment over the summer. One robot was purchased before school started , but there was still a need for about $6,000 to buy additional robots, computers and provide competition funding. To make matters worse, the required Robots were on backorder for 6 weeks by the time the robot club had its first meeting. Essentially, it became imperative to find some additional donors and money to help the Frankton Junior High Robotics Club get established, get the robots on order, get the kids in training and get ready for the competitions starting in December. Fortunately, some local companies stepped forward to help out. CB Fabricating of Anderson, Majestics of Summitville, E&B Paving of Anderson, Solutions4ebiz of Pendleton, Delaware Wood Products of Muncie, and Poet of Alexandria all gave to start the robotics club at Frankton. CB Fabricating out of Anderson, Indiana, provided a $1,000 donation to the club. CB Fabricating is a sheet metal fabricator that relies on the art of computer programming to produce some of their products, and is most interested in seeing kids start out with as much technology training as possible. Chris Barkdull, the owner and founder of CB Fabricating provided his donation to the robotics club to enrich the local kids with technology training that may someday come back around to be potential employees with a solid technology background. Chris was made aware of the need by Michael Sheward, a Frankton graduate, who is one of the founders of Solutions4ebiz, another Madison County technology company located in Pendleton, Indiana that markets internet based products and provides computer programming services. It so happens that CB Fabricating acquires marketing services from Solutions4ebiz, so the two companies now work locally. Solutions4ebiz also provided some funding for laptops for the club and assisted in fundraising. "Historically, the athletic departments get a lot of external funding, but I wanted to see donations go to academic activities for a change and the robotics club was a good reason", according to Sheward. The long-term desire for the donation by CB fabricating is to continue to provide a path for learning programming skills all the way through high school. Starting kids out at a young age and letting their excitement grow as they grow older is the best way to keep them with momentum and excitement for the robotics field. There is a lot of activity within Madison County regarding robotics. Ideally, some of these kids will want to stay in Madison County as Robotics Engineers. On top of the donation, Chris also has invited the robotics club to come over to his fabrication shop and take a tour of the facility. He will show the kids how CB Fabricating uses programming skills to make products. "One of the most important skills needed in industry is the ability to write computer programs, so I hope my donation goes a long way towards them acquiring that skill, regardless of where they use it", according to Barkdull. Barkdull also hopes that his donation will encourage other local companies or private individuals to donate money to these robotics clubs to help make our area elementary and junior high schools into first class robotic competitors. It is good to have a corporate link to these robotics clubs because the equipment can be expensive to pull out of tight school budgets. "The donations help free up my time to focus on training with the kids and preparing for competitions, rather than spending a large amount of time fundraising", according to the club leader, Mrs. Watters. "These donations are greatly appreciated and we hope to show our donors our robotic skills at the competitions soon", said Mrs. Watters. Whether it be the teachers, corporations, donors, and even the kids, the goal is to make Madison County one of the best robotic training centers around. The donations are making this happen at an earlier age.